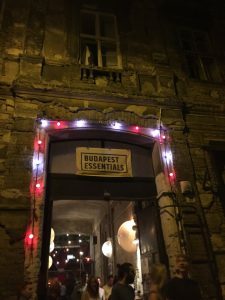 As part of my recent InterRail trip I visited some of the most unique bars in Europe – Budapest’s ruin pubs! A visit to the city is not complete without touring these unique pubs. Read on to discover what exactly these pubs are, where to find them, and what makes them so special. 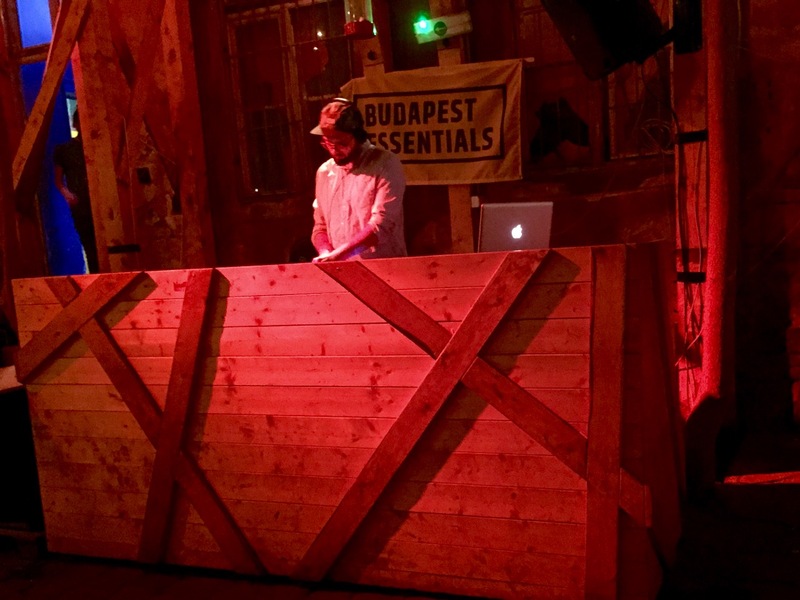 The formula for creating a ruin pub is simple – find an old, abandoned building in Budapest’s jewish quarter, install a makeshift bar and some rustic furniture, get some artists to add some quirky decorations and artwork, then invite all your friends for a beer. 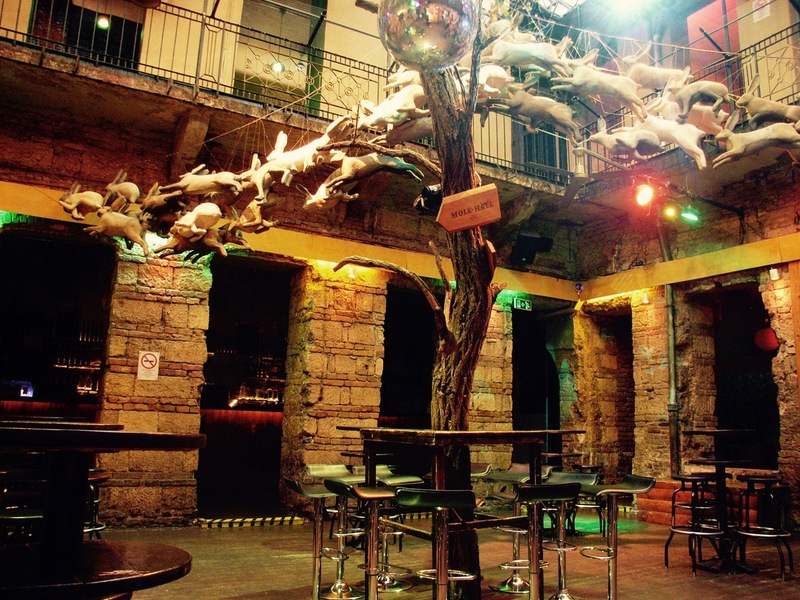 The first one, Szimpla Kert, opened in 2001 and offered locals with a place to get cheap drinks. The trend has grown massively over the years, and have become some of the city’s trendiest places to drink and hang out. Today, there are several, all within walking distance in the area that used to be the city’s Jewish Quarter. 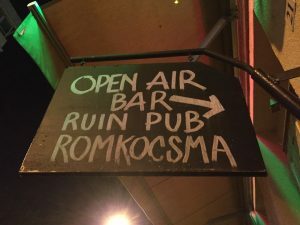 To get a guided tour around a few of the most popular ruin pubs, I went on the All Night Crash Pub Crawl, which starts at Oktogon Square every night at 9pm. The crawl itself is great value at €10 each if you book online or €15 on the day. 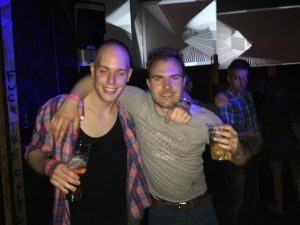 On the night I went the crawl attracted a fun, multi-national crowd of Germans, Swedes French Canadians, Americans, and a group of lads who met at an international school in the UK, on their gap year InterRailing around Europe. One of their group almost didn’t make it due to a diplomatic technicality – when their train went through customs entering Macedonia, he was informed that Macedonia don’t recognise his Palestinian passport, so he wasn’t allowed in. Four days and €1000 later, however, and he made it to the bar crawl on time. Below are the top four ruin pubs we visited that night – there may have been more – but thanks to a haze of cheap alcohol, they didn’t make a big enough impression to make this shortlist. Fogasház was the first ruin pub we visited, and consisted of a large central courtyard with a number of rooms coming off it, including a games room full of pool tables and pinball machines around the back. 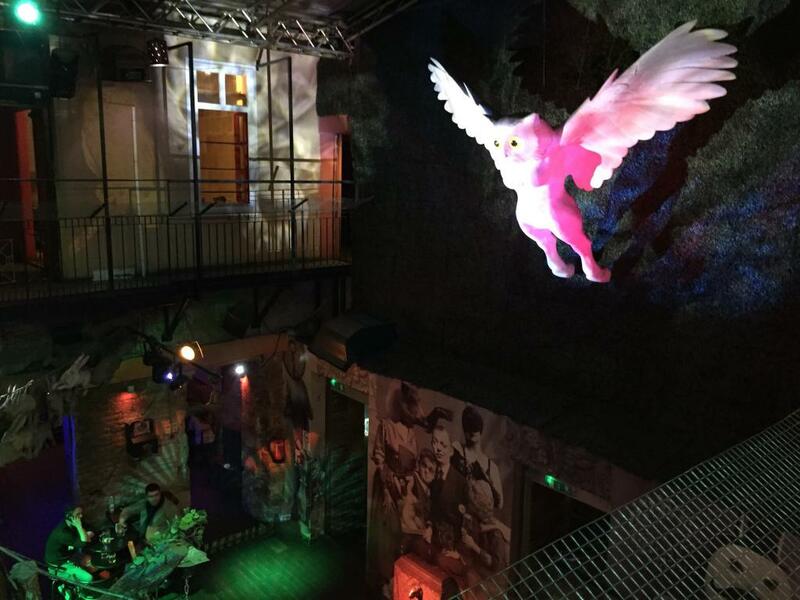 You can immediately understand why it’s called a ruin pub – the walls surrounding the courtyard were covered with wooden scaffolding, as well as a few trees and a large multi-coloured circus tent covering part of the courtyard. The main courtyard bar has a DIY look to it, made from un-treated wooden beams and plywood panels with a tiled roof. As part of the pub crawl cover charge we were given a free entry drink (a choice of beer or cider), plus a free shot. We then got to know each other while listening to the DJ’s super trendy soundtrack. Based on Fogasház’s Trip Advisor page, the team here spend a lot of effort creating the venue’s relaxed vibe. Drinks are generally cheap, around 600 Forint or €2. That’s right – Hungary uses the Forint, not the Euro, however both our the bar crawl and our accommodation accepted, and actually preferred accepting Euros. It’s a good idea to carry both for this reason, plus it’s easier to keep track of the true price of something in Euros thanks to the simpler denominations. The cheapest bar we went to in Budapest were offering pints of their local beer for just 100 Forints, or €0.32, which is unbelievably cheap, as most drinks were around 200-800 generally. Like Fogasház, Füge Udvar also has a courtyard layout with a range of other rooms coming off it – not surprising, considering the pub’s name – Udvar means courtyard. There are actually two courtyards, on one side you’ll find Udvar Rom, which has a hostel above it, while the other courtyard is the main Füge Udvar pub. 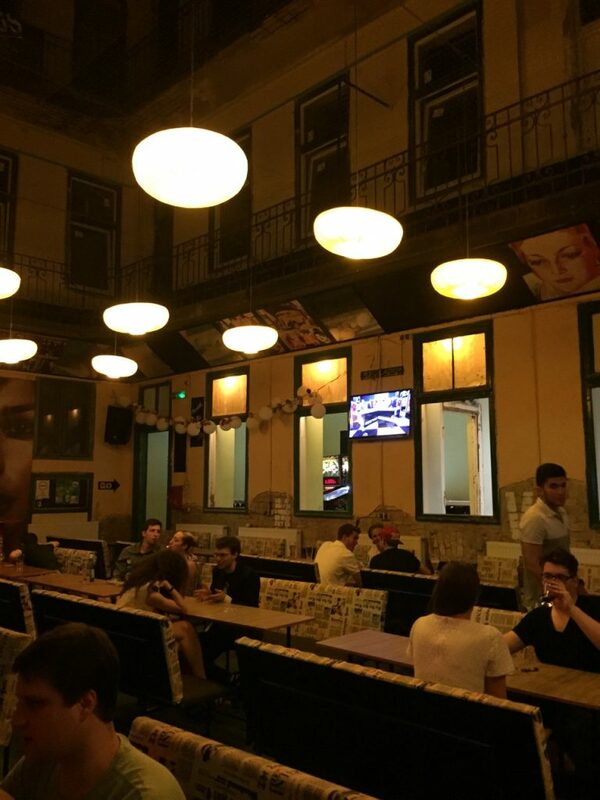 In both courtyards you’ll find a large bar at the back under a wooden roof, serving a wide range of drinks including local beers like Dreher, Borsodi and Soproni, plus Czech and German beers. Again, we were given free shots as part of the bar crawl. This pub didn’t look quite as much like a ruin as Fogasház, the walls have less of a crumbling look to them and the whole thing looks like it’s been maintained for longer. The building was only built around 50 or 60 years ago initially as a block of flats, until it was converted into a pub and hostel. On the Füge Udvar side you’ll find graffiti murals in the courtyard giving it a trendy run down look, while the other courtyard has a few bits of exposed brickwork, giving it a more distressed look. The pub attracts a mix of tourists, expats and locals, according to their TripAdvisor page, and well worth a visit. Drinks are cheap, with a happy hour on weekends serving up cocktails for just 790 Forints (€2.55). There’s also a range of pinball machines, table football and air hockey tables to challenge other patrons at, so a great place to go if you’re travelling solo and want to meet some fellow travellers! 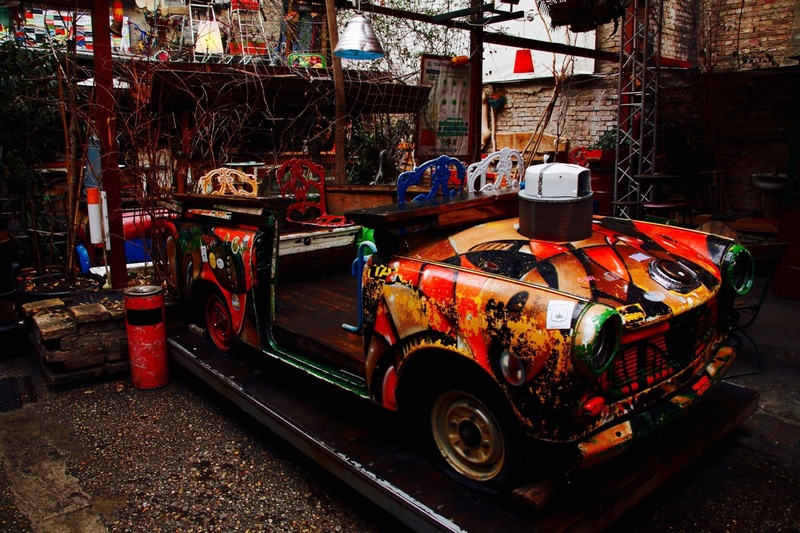 Szimpla Kert translates to English as “simple garden”, named after it’s large central open space with some really unusual furniture, for example an old Eastern German Trabant turned into a seating area, amongst the usual ramshackle furniture. The side rooms also have some pretty unusual arty furniture too, such as an old bathtub with a side cut out to make a sofa. 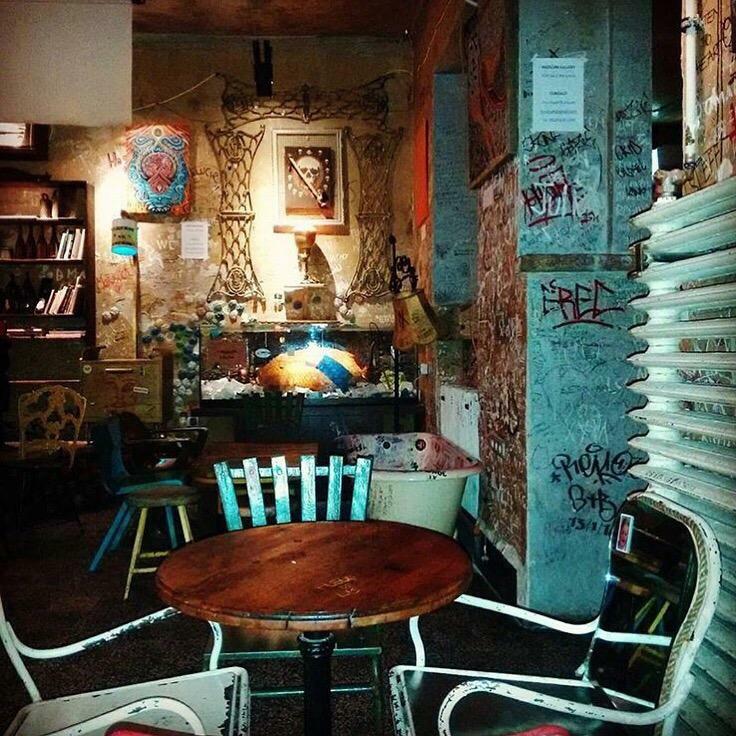 The walls are also covered in graffiti to give this bar a real abandoned look – unlike at Füge Udvar where walls are covered with murals, the graffiti here is more like the sort you’d find in a crack house – but in a trendy, hipster way. This ruin pub is clearly a hit with tourists and locals alike – on TripAdvisor out of 2,326 reviews, 1740 rated it as ‘excellent’, so well worth a visit! Instant is probably the most quirky of the lot, and not really a pub, either, as it is mainly know for it’s clubbing. It’s by far the largest ruin pub in the city, as well as one of the newest, with a mind-boggling 26 rooms, 7 bars, 2 courtyards and 7 stages. Unlike some other night spots in the city, Instant doesn’t have a cover charge, yet drinks are still cheap, and the party doesn’t stop until 6am! This was our last stop on the pub crawl, and after our welcome shots, we began exploring the labyrinth of interconnected rooms, leading through to the 7 main rooms, each with a different style of music. This is surely one of the most quirky clubs I’ve ever been to. Exploring the club, you’ll find that many of the smaller side rooms have themes, with weird and wonderful artwork giving the rooms their own character. 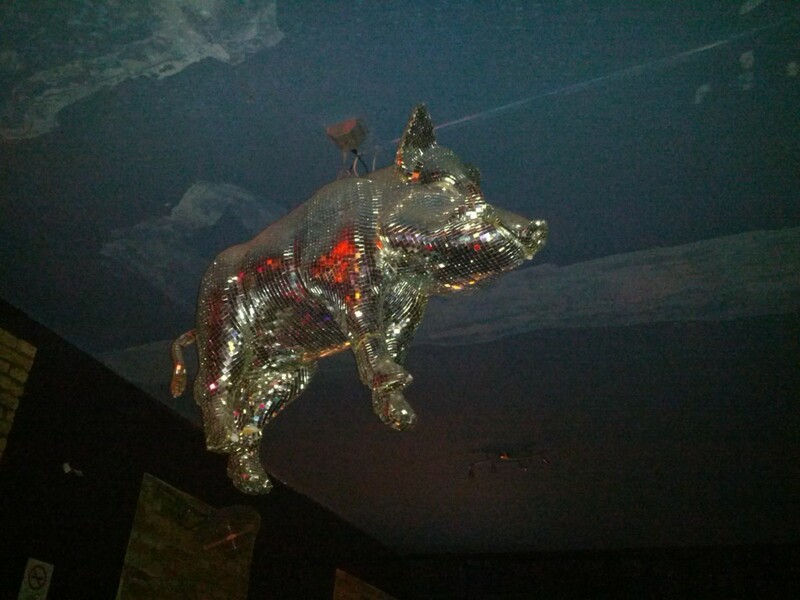 In one of the bars there’s a giant disco ball in the shape of a pig, while in one of the two courtyards, there’s a figurehead of an angel with an owl’s head hanging on the wall above the dance floor. If you come in a group and want to see each other later in the night, don’t split up – this place is huge and you will get lost! Have I missed any top ruin pubs off this list? Let me know in the comments below! I was these ruin pubs, and they truly amazing! :) Thanks for the tips! There are my tip for you: if you are interested in an easy way to find everything you need in Budapest, I can recommend you a free and easy-to-use app called Huny (you can check it on Facebook: https://www.facebook.com/HUNY-152552281769703/timeline). Also have a navigation system. And the best: you can find what’s open in real time. It was really useful and helped me a lot. Thanks for the tip Naomi! I’m heading back to Budapest this summer so I’ll try out the app!